I wish I'd had this before I started my last two projects. It's 1am, and you can't sleep. You've been struck with a brilliant idea and you can't get it out of your head. After fidgeting in bed for an hour, you go down to the basement and start coding. By 7am you have a working prototype. You keep working on it evenings and weekends; creating new features, refining the design, and building out the billing system. Soon, the whole thing is ready for launch. You deploy it to production, and wait for your first customers to sign up. But the customers don't come. What happened? "Programming is black and white. Marketing is a world of gray." Quit looking for that magical growth unicorn. You don't need to win the startup lottery. You can earn a good income from building and launching your own products. 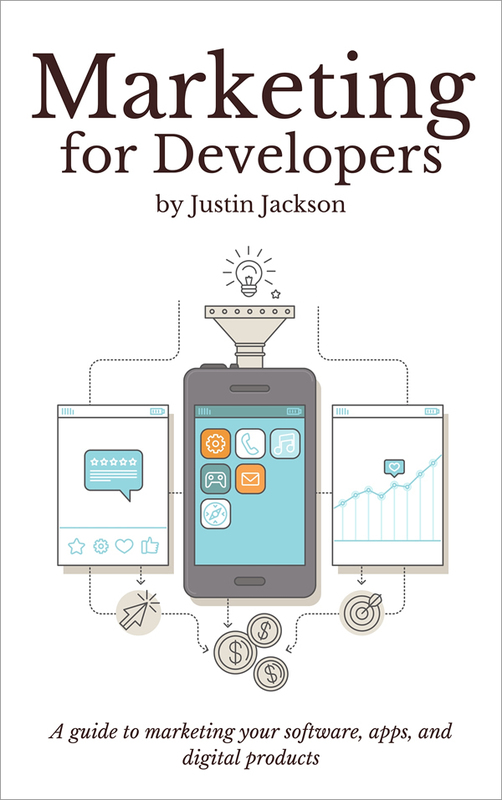 Sign up for my mailing list, and I'll send you a free PDF from Marketing for Developers. I won't send spam. And you can unsubscribe whenever you like. This guide is packed with tactical advice. Tired of shipping projects that fail to get traction? You'll also learn how to grow a launch list from the moment you start building your product. Don't worry about launching to crickets. This time you'll have people waiting to purchase your product on day one. Get the book and some great videos to boot. Build something people want. Learn the Lean Marketing Stack. Get the launch checklist. And, follow the launch tactics to get your first 100 customers. Just launched, but need traction. The PDF is 160 pages. There is also an ePub, Mobi and web version. You will be emailed your username + password after purchase. 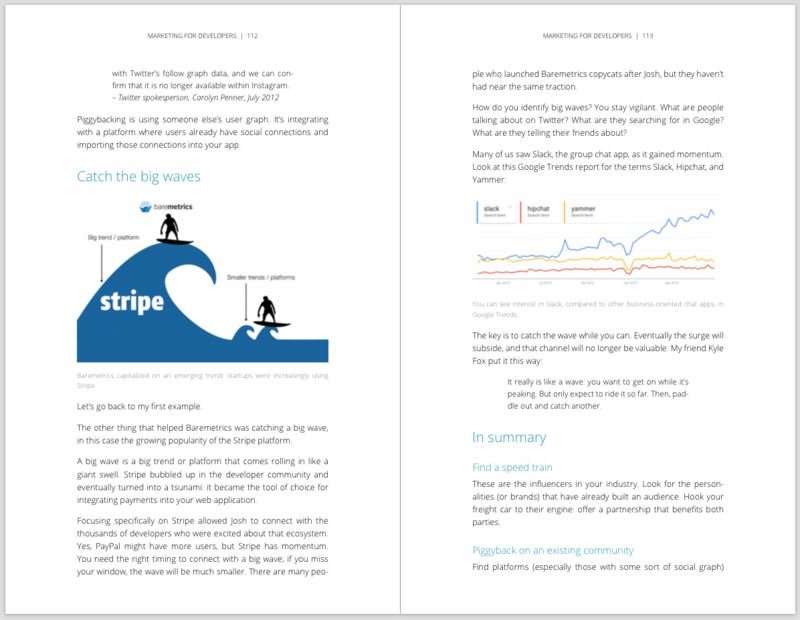 Click here to see a preview of what the book looks like. Worksheets: Prospects Ranked by Priority (Excel), Audience Discovery (PDF). 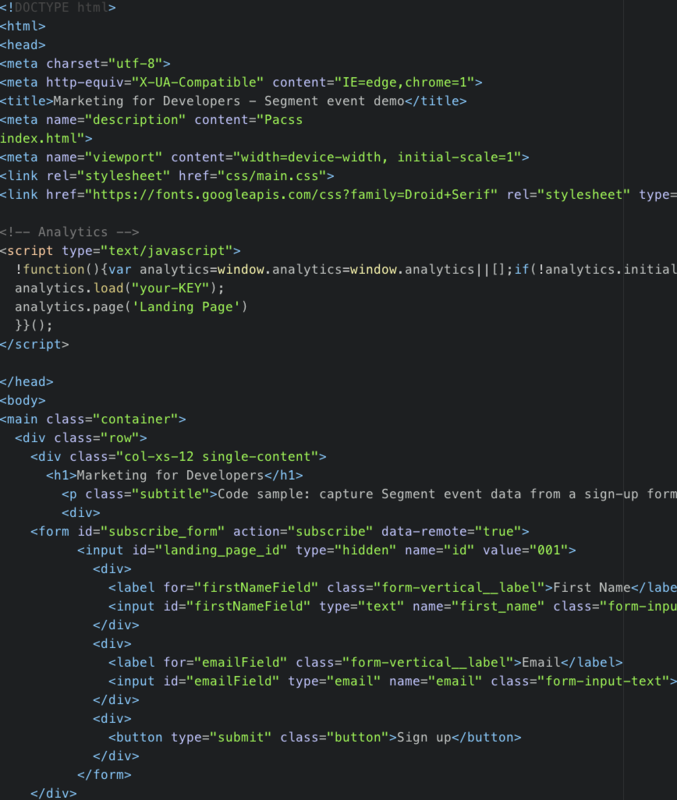 Code sample: implementing Segment tracking in a simple HTML form. I've been building things with computers since 1983. When I turned 12, I became the SysOp of a local BBS. In the 10th grade I sold my first product, and in 1993 I built my first website. 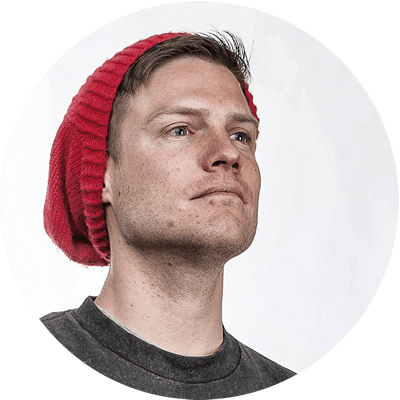 Recently, I've been the host two podcasts: Product People and Build & Launch. Currently, I'm passionate about helping makers earn an income from the things they create. I live in Vernon, BC with my wife and 4 kids. (Yes, I said 4). For fun, I ride bikes, snowboard, and drink fine beer (sometimes all at the same time). A guide to marketing your software, apps, and digital products.